SOEKS 01M - Generation II (2014) English, German, French Languages. 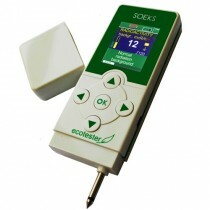 The SOEKS 01M 2014 dosimeter is a fully reworked version of the SOEKS 01M radioactivity indicator. The new generation of the SOEKS 01M has inherited all the best traits of its predecessor. 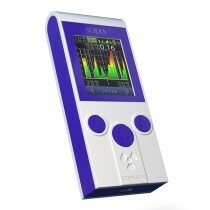 It’s easy to use, reliable, and boasts both small size and a crisp color display. 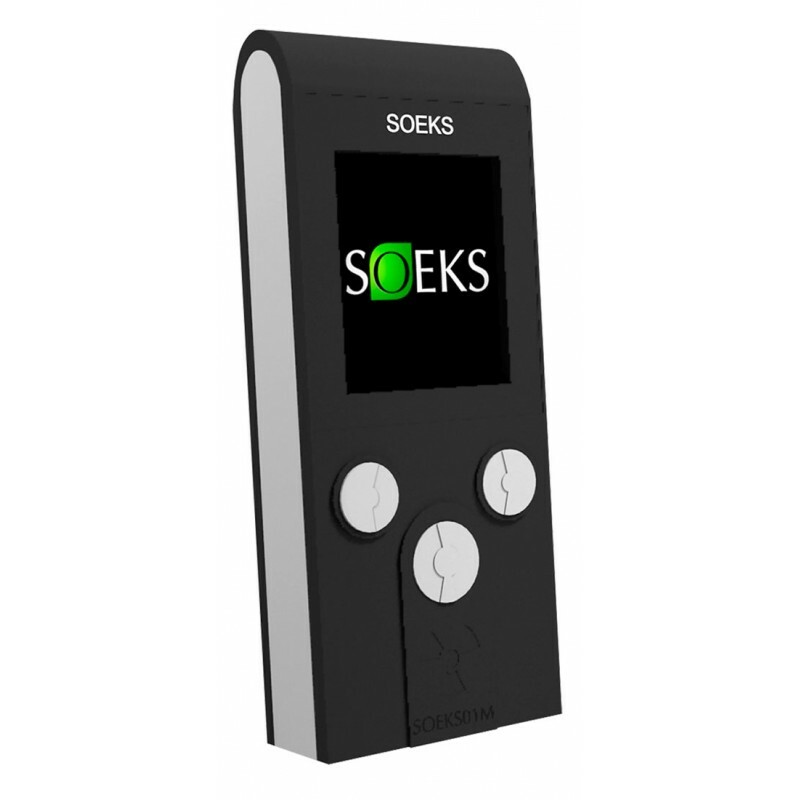 The SOEKS 01M GENII has allowed us to combine the reliability of a consistently used consumer device with the precision of specialized lab equipment, while maintaining the ease of use expected from a modern day mobile device. 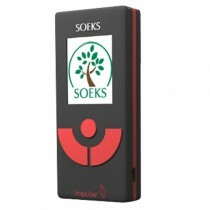 The Nuclear Radiation Detector “Soeks” is designed for assessing the radioactivity level of any item and detecting objects, food items and construction materials contaminated with radioactive elements. It easily gauges radioactivity levels based on ion radiation intensity (gamma radiation and beta particle stream) and x-ray radiation levels. 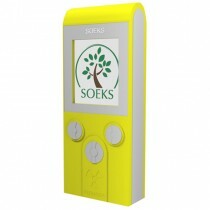 Radiation Detector “Soeks” is superior to other household radiation dosimeters. 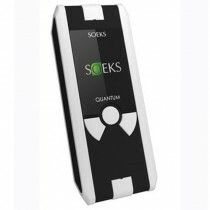 Radiation Meter “Soeks” were acknowledged Model of the Year 2011 due to their exceptional performance and high levels of precision. 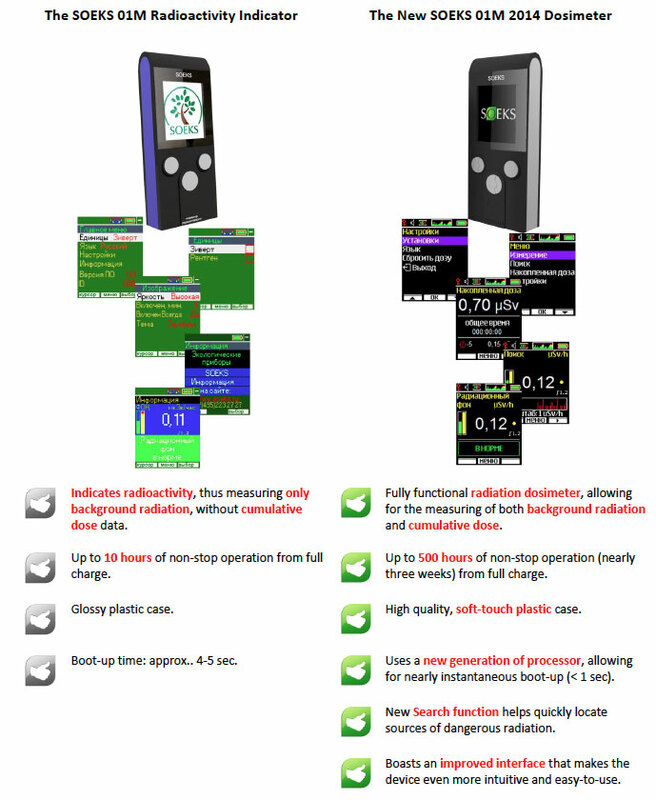 Typical radiation detectors display exposure dosage ranging from 5 to 1,000 μR/h, while Soeks devices provide a higher level of precision, from 5 to 100,000 μR/h. Only the Radiation Detector “Soeks” boasts a color display, graphical representation of measurements and 127 measurement points. The device also possesses a hi-tech design, is lightweight, compact and capable of being charged via USB. The biggest issue with standard issue devices of this type is that the majority of household radiation detectors have radioactive sensors made in the 80’s, right after the Chernobyl disaster, and as such, their life cycle is swiftly coming to an end. In contrast, Radiation Detector “Soeks” possess sensors that are up-to-date and much more accurate. TWO YEAR MANUFACTURER WARRANTY for purchases made from our official website or our eBay Store (BigSeaMall). Service Centre* in Australia. 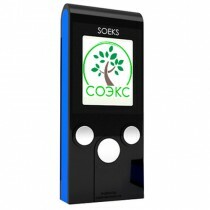 SOEKS.COM.AU is the Authorised distributor and representative of SOEKS devices in Australia. *Item is stocked in Australia. Next day delivery can be achieved if item is ordered and payment settled before 4:30pm on business day. Not all area in Australia is covered in the Australia Post Express Delivery network zone. It may take up to 3 days if you are not in the Express delivery zone. To check details, go to www.auspost.com.au Please check Delivery information for shipping details.